3. 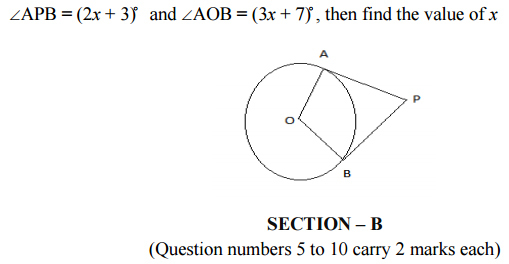 Section A contains 4 questions of 1 mark each. Section B contains 6 questions of2 marks each. Section C contains 10 questions of 3 marks each. Section D contains 11 questions of 4 marks each. 1. A letter is chosen at random from the letter of the "word PROBABILITY". Find the probability that it is a not a vowel. 3. A pole 6 m high casts a shadow 2√3 m long on the ground, then find the angle of elevation of the sun. 5. Find the sum of all natural numbers that are less than 100 and divisible by 4. 6. 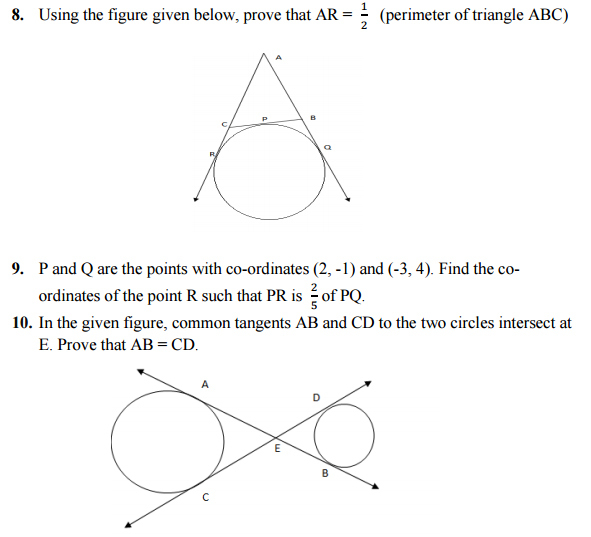 Find the value of p for which the points ( -1 , 3 ) , ( 2 , p ) and ( 5 , - 1 ) are collinear. 7. Find the value(s) of , for which the equation kx2 - kx + 1 = 0 has equal roots.